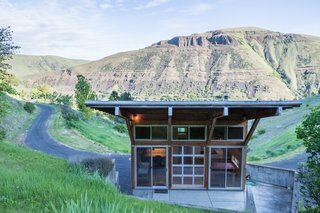 Perched above Idaho's calming Clearwater River, this striking property hits the market for $650,000. 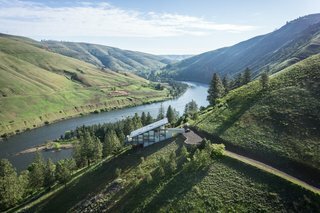 Designed by Washington–based architect Paul Hirzel, the award-winning Canyon House of Juliaetta not only overlooks spectacular views of the river and mountain range, but also includes a breathtaking 46 acres of land. 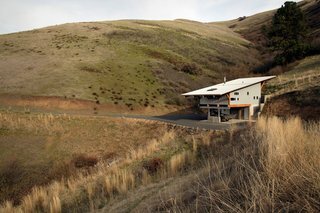 Located just 20 miles from the city of Lewiston, the property, which is available for sale through Tomlinson Sotheby's International Realty, provides uninterrupted nature, as well as easy access to urban conveniences. 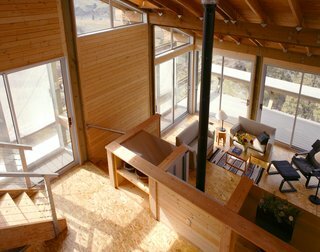 The 1,456-square-foot house has an open floor plan that's split into four levels, all of which are connected by a staircase. 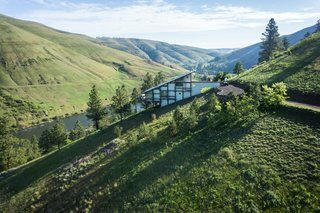 The stepped structure of the home follows the topography of the terrain, and has a sloping roof that creates a bold, slanted profile. 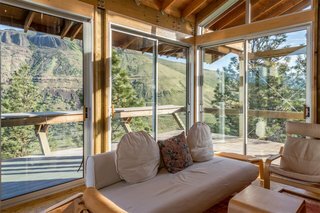 The interiors—which are integrated into the terrain—present dramatic vistas of the river below, as well as the surrounding mountains. The open plan layout gives the interior a high level of transparency. 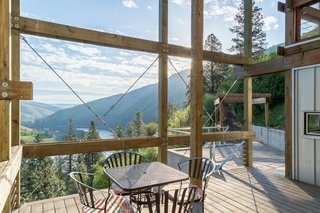 The stunning canyon views can be enjoyed from all four levels of the house. 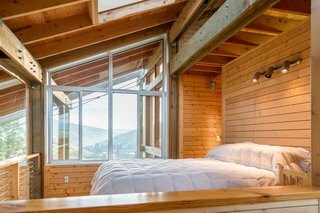 Thanks to expansive windows throughout the home, the interior feels bright and airy. A wood-burning stove keeps the living room extra-warm and cozy in winter. 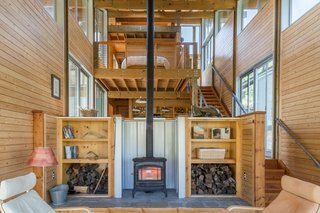 The home also features a deck that wraps around the living area. 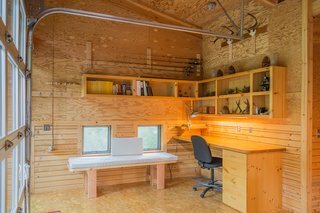 The lofted bedroom has a snug, cabin-like feel. 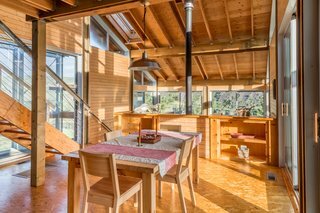 Unfinished particle-board floors, paneled walls, and exposed wooden beams give the interior a natural and rustic feel, while large expanses of glass and clerestory windows infuse a modern vibe. 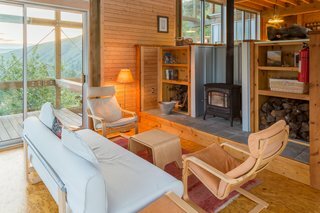 Along with the amazing 46 acres of land, the property also comes with a bunkhouse annex that contains a workshop, kitchen, and wine cellar. The entrance to the bunkhouse. The workshop in the bunkhouse. This home is now on the market for $650,000. For more information, contact Lyssa Kope at Tomlinson Sotheby's International Realty.